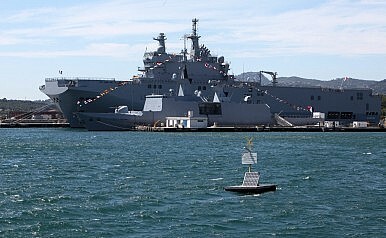 The BPC Dixmude (L9015) moored behind the stealth frigate Surcouf (F711) on the 14th of July 2011, one day after she arrived in Toulon from Saint-Nazaire for fitting out. There are immense barriers to France ever selling its Mistral-class ships to China. Yesterday, I took a look at the largely apocryphal notion that China may be eyeing France’s Mistral-class advanced amphibous warfare ships — specifically, the two ships that were originally built for Russia but later withheld after Vladimir Putin’s decision to annex Crimea and support anti-government rebels in the Donbass. In that piece, I perhaps focused a bit too much on the impressive hardware of the Mistral itself and less so on the huge reasons why it is incredibly unlikely that China will ever purchase or operate one of these ships as part of the People’s Liberation Army Navy. I outline the reasons for that in what follows. Over the years, the European Union’s relationship with China has transformed, and simultaneously, member state positions on the utility of the embargo have shifted. France, in the mid-2000s, actually became one of the major proponents of ending the embargo. The context of the French push to end the embargo is important. It came at a time when China was swiftly ascending on the global stage as a major economy. China had acceded to the World Trade Organization (WTO) and seemed to be playing by the rules internationally. The fear that China would behave as a revisionist power on the international stage existed, but had little in the way of evidence to support it. The concerns that exist today about Chinese assertiveness within the First Island Chain and Beijing’s overall interest in military modernization were far less widespread. The French argument in favor of ending the embargo is worth appreciating as well. In 2005, Michèle Alliot-Marie, the French defense minister, noted that by selling arms to China — which was just gearing up its now-formidable domestic arms manufacturing base — the European Union could ensure that Beijing’s indigenous capabilities would be modest. Of course, Alliot-Marie’s claim was also based in French self-interest: France was, and is today, a major producer of arms for export. The French, at the time, wanted China to be available as another major market for defense goods, similar to India. France wasn’t alone in the EU in calling for the embargo to the be lifted, though it was the main proponent of the “preventing Chinese self-sufficiency” argument. The U.K., under Tony Blair, claimed that the embargo was ineffective since it was legally nebulous. Italy also argued for lifting the embargo. Despite the embargo, the U.K. and France have been able to conduct defense commerce with China. They have sold, among other equipment, underwater radars and helicopters. Both states understand the EU’s embargo to apply solely to major arms platforms and lethal weapons — the Mistral-class ship fits into both categories. In the meantime, the intra-EU debate on the embargo has continued. What’s more, just 13 months ago, reports emerged that despite the embargo, “billions” in European technology was making its way into the Chinese military in the form of licensed dual use, non-lethal technology, and some lethal technology as well (“smooth-bore weapons”). One analyst noted at the time that “without European technology, the Chinese navy would not be able to move.” Despite the commercial shift, the political and strategic ramifications of the embargo have remained immutable. Today, however, China’s image within the European Union is vastly different than it was ten years ago. The EU is concerned about China’s military modernization and, like the United States and Southeast Asian states, about China’s land reclamation activities in the South China Sea and dispute with Japan over the Senkaku/Diaoyu Islands in the East China Sea. Alliot-Marie’s prediction about China’s self-sufficiency seems to have come true as well, at least when it comes to shipbuilding: in its 2015 report on China’s military, the U.S. Department of Defense draws attention to China’s considerable expertise and efficiency in building warships. Meanwhile, the European Union, which established a singular post for a top diplomat to represent its Union-wide interests in 2009, is increasing its visibility as a participant in East Asia’s many security forums. Though Europe will not play a major role in determining the future of Asian order, it wants to be present at the table, making sure that its values and concerns are represented. Thus, in today’s strategic milieu, there is little chance that the arms embargo against China will see a formal end, despite the healthy debate on the issue that emerged within the Union in the mid-2000s. Consider also that even if the embargo had been lifted in the mid-2000s, France would still likely have been unable to sell Mistral-class vessels to China. After all, the concerns that prevented the sale of the ships to Russia would apply equally to China, if not with the same urgency. French President Francois Hollande, just over two months ago, met with his Philippines counterpart and stressed that France would not back the use of force or coercion in the South China Sea. The two leaders noted their “opposition to any acquisition or claim, by coercion or force, of any or all territory of a State by another State, in violation of international law, especially the Charter of the United Nations.” Handing China an adept amphibious warfare platform would warrant a good deal of French cognitive dissonance on the matter. As for the EU’s embargo, it may be here to stay until China either drastically alters course or acquiesces to European demands — neither of which seems likely given current realities. In 2007, the conditions the European Union presented to China for the abolition of the embargo were for Beijing to: 1) ratify the UN International Covenant on Civil and Political Rights (ICCPR), 2) a complete abolition of the Chinese laojiao or reeducation through forced labor system, and 3) free any remaining Chinese dissidents jailed for their involvement in the events of June 4, 1989. China will comply with the second demand per its November 2013 reform package, but implementation remains problematic. ICCPR, which China signed in 1998 but failed to ratify, meanwhile, lurks on the horizon, but has found a place in China’s political discourse. The third demand — the one with the most direct relevance for the reason the embargo came about in the first place — has seen limited progress. So, if you read about the Mistral possibly going to China, consider this broader strategic context between the European Union and China. Given the embargo and France’s broader foreign policy, a Mistral sale to China is highly unlikely.